Each and every canine that has ever served in the United States military around the world is to be applauded for unselfish devotion, courage in battle and unquestioned loyalty. 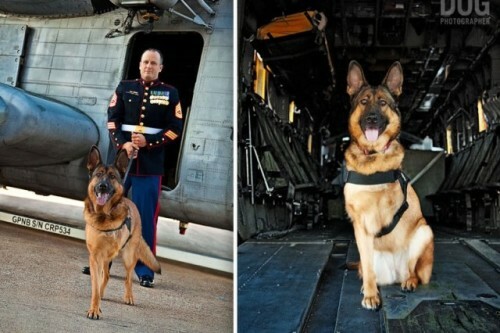 There have been many unspoken heroes among the dogs of war throughout the decades. Read this story about one very special four-legged soldier who won the hearts of many for her bravery under fire and supreme sacrifice. 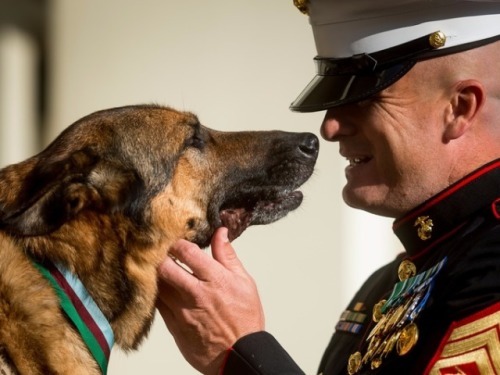 Some two months ago, a valiant, 12-year-old, retired U.S. Marine Corps dog named Lucca, who lost a leg while serving in Afghanistan, received the PDSA Dickin Medal from a British animal care charity. The beautiful half-German Shepherd and half-Belgian Malinois mutt became the first marine dog to ever be awarded this special prize. Sixty-six dogs, pigeons, horses and even one cat have received this coveted award down through the last 7 decades, which is the animal equivalent of the Victoria Cross, England's highest military honor. "I know you don't understand the words, but I hope you sense the human warmth, gratitude and pride that we all feel for your heroism and for a job extremely well done." And Lucca is a heroine in more ways than one (400 to be almost exact). According to the People's Dispensary for Sick Animals (PDSA), over a period of six years this top search dog led more than 400 missions in Iraq and Afghanistan, saving hundreds of military lives by sniffing out ammunition, weapons and over 40 explosives along the front lines ahead of approaching troops. Her talents were utilized for many diverse military operations concerning roads, vehicles and buildings. In 2011, she was directly responsible for the capture of four Improvised Explosive Device (IED) manufacturers involved with several terrorist cells in the region. In March of 2013, it all almost ended for this courageous canine. While out on patrol with one of her two handlers, Corporal Juan Rodriguez, she indicated the presence of an explosive, which was safely detonated. While seeking out potential secondary IEDs, a device went off, causing severe burns to her chest and terrible damage to her front leg. 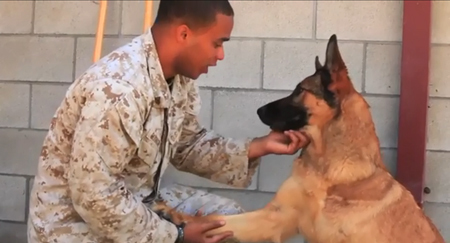 Despite her agony, this valiant canine rushed to her trainer, attempting with what was certain to be her last few breaths, to protect him and other nearby Marines. But Lucca was blessed with a loving and grateful guardian angel in the form of Corporal Juan Rodriguez, who never left her side and applied a tourniquet to her gaping wounds. Quickly, he had her airlifted to the unit's medical center where she was stabilized and then sent back to Germany and then finally, Camp Pendelton. There, army surgeons amputated one of her front legs and she endured painful physical rehabilitation with the same courage and fortitude she demonstrated on the battlefield. While no one who knew her was really surprised, Lucca made a complete and miraculous recovery. She now resides with her first handler, Gunnery Sergeant Willingham and his family, and basks in a happy, stress-free life. There are no words to truly express the gratitude for her bravery and loyalty. And perhaps, there is only one suitable word for this courageous canine. Valor, thy name is Lucca.